The Bodum brand has long been trusted with the plunging of coffee and tea… one of the most critical responsibilities any company could possibly take on. We know that Bodum can do that extremely well. After all, it’s what Bodum does best. That’s why you should reach for Bodum again when it comes to brewing the perfect pot of tea. With a body made from borosilicate glass, this Chambord Teapot can handle the extreme temperatures of boiling water, and no matter how many times you refill it with fresh, loose leaf tea, the glass won’t cloud. 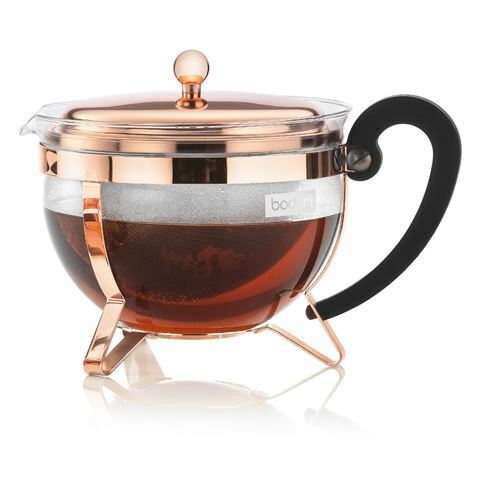 The copper plated accents earns this very attractive teapot extra style points, while the removable steel tea basket helps you to avoid a bitter brew. Designed in Switzerland, made in Portugal. Lid is made from copper plated steel, while body is made from lightweight borosilicate glass. Removable stainless steel tea brewing basket. Presented in a Bodum box.